JH Motorsports is excited to now offer the JHM Rear LSD Pre-Built Rear Differential Core Program. Installing a rear LSD can be simple work, if you have experience and the variety of tools required to properly install an LSD into a rear differential. However, a majority of people do not have that luxury which is why we now offer the JHM LSD Pre-Built Rear Differential Core. What is a Pre-Built Rear Differential Core? A pre-built core is an OEM Rear Differential that we have pre-installed our JHM Helical Rear LSD into here at JH Motorsports, meaning the customer does not need to perform any specialty work to have our JHM Helical Rear LSD installed in their car. All the customer will need to do is a simple swap of rear differentials and they are ready to hit the road with their new found grip. Since this is a core program, you will be receiving a Good Used OEM Rear Differential in exchange for yours. We inspect all differential cores when they come in to make sure they are in good working order before they are rebuilt (Some cores may look different than your original differential due to different locations and weather climates). During the installation of the JHM Helical Rear LSD we will also refresh the differential with all new Ringer Gear Bolts, Seals, and O-rings! ALL JHM Rear LSD Pre-Built Rear Differential Cores will come with a 12 Month Limited Warranty as well as a Limited Lifetime Warranty on the LSD itself. NOTE: ALL rear differentials will NEED to be shipped DRY to JH Motorsports. ALL rear differentials shipped FROM JH Motorsports will be DRY. You will need to fill the rear differential with gear oil before driving the car. NOTE: Rear Differential Cores will NEED to be packaged very carefully when shipping to JH Motorsports. Any damages to the rear differential from shipping will automatically cause the rear differential to NOT be accepted as a core. 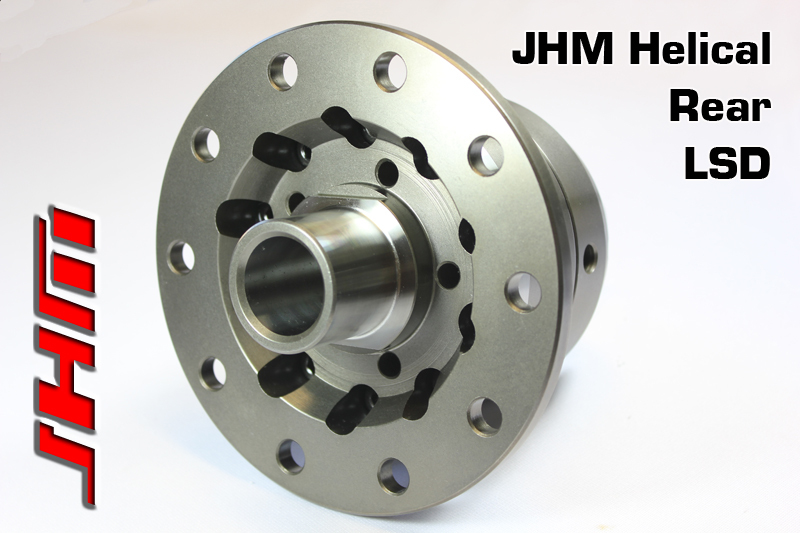 INTRODUCING THE JHM HELICAL REAR LIMITED SLIP DIFFERENTIAL!!! After years of research and development, we are proud to release our JHM Helical Rear Limited Slip Differential (LSD) for the B6-B7 A4 and B6-B7 S4. In the stock Audi rear differential, the torque from the motor that's sent to the driveline is evenly divided between the two rear axles. In most driving situations this is normally fine. However, in cases where traction is lost at one wheel (i.e. under hard acceleration out of a corner or launching from a stop) power is only being sent to the spinning wheel. In these situations, a gear-based limited slip differential will take the torque from the wheel that's starting to spin and send it back to the wheel with that's not - the one with better traction. This means that both rear tires will spin together - with or without traction. - Improves traction and predictability of vehicle behavior: both rear wheels will spin at the same rate. Under hard acceleration out of corners or launching from a stop the car will either "hook up" and go or both rear tires will spin. Some "track focused" drivers say that this allows you to steer the car better with the throttle. - Prevents "one-legging" (spinning one rear tire only) and therefore eliminates losses in acceleration under load out of corners and heavy acceleration from a stop (launching). - Maintenance free! There are no clutch packs to replace as they wear out. - No special gear oil or additives necessary. Again, since there are no clutches, you can run the same gear oil as recommended by Audi in our LSD. - Our JHM Helical Rear LSD comes with a Limited Lifetime Warranty against manufacturer defects. While we recommend our LSD for anyone looking to improve the traction and predictability of their quattro Audi, the more horsepower your car has or the harder you drive, the more our JHM LSD will make a difference in your car. Installation Note: When replacing the differential, the factory repair manual states that you must check ring gear backlash and bearing pre-load. Our JHM LSD is built to factory tolerances and all the differentials we have swapped at our service facility haven't required "re-shimming". However, due to variances in factory tolerances, it is best to make sure that these measurements are checked and confirmed. Additionally, if you do not have the right "bearing splitters" to remove your original bearings with a press, install them on the JHM differential, and correctly inspect for wear or issues you may need to replace the differential bearings. If you have concerns about your tools or your ability to properly inspect and/or disassemble and re-assemble your differential please don't hesitate to contact us. We can perform all of this work for you if you send us your differential housing. FITMENT: The JHM Helical LSD is a direct replacement for OEM differentials with the following part numbers: 01R525121D or 01R 525 121 D. We're working to identify all the cars and differentials our JHM LSD will fit. So far we, have confirmed fitment in Automatic-Tiptronic rear differentials with the following 3 letter codes: GDF. It is important that your car's rear differential has the correct style housing. We have found that some 2007 and up cars have a different style housing that won't accept this version of our LSD. Our current JHM LSD will fit in the differential cases that are black and have a cover for the case that bolts on to the side of the housing to get the differential out. If your differential has the newer style, aluminum case that has the cover on the rear of the case, this version of our JHM LSD will NOT work for your car. We are working on a solution for these later style differentials as well as others based on customer inquiries and market demand.